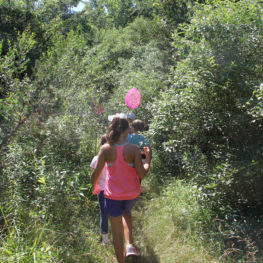 Fresh air, muddy feet and new friends are all part of what makes our Nature Day Camp so special! 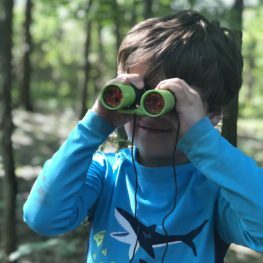 Each summer, children ages 3 to 13 come to Fairview Farm Wildlife Preserve in Bedminster, where 170 acres of forests, meadows, streams and a pond invite young explorers outdoors. 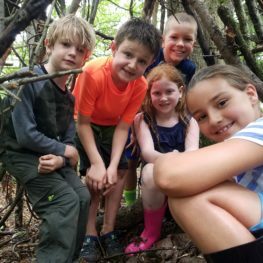 Each day at Nature Day Camp is a unique experience. Structured and unstructured play time allow children to interact on their own terms with nature. Curiosity and wonder are encouraged, and our activities, crafts, games and storytelling provide positive outdoor experiences and memories that last a lifetime! We offer nine Monday-through-Friday day camps in July and August for children ages 3 to 13. Our friendly camp counselors are First Aid and CPR certified. Campers should dress for outdoor play and bring a change of clothes (including a bathing suit), a nut-free lunch and snack, and a reusable water bottle. Bug spray and sunscreen should be applied at home, and tick checks performed at home at the end of each day. Camp is held rain or shine! We have plenty of indoor education space, but kids should be sure to bring a raincoat and boots for outdoor fun on rainy days. Once children are registered, parents/guardians will receive an emergency contact and allergy form to complete for each camper. Teen helpers are needed each session. A great way to earn community service hours and have fun! Please contact us to find out more information. Camp alumni are encouraged to apply! Discounts: Receive a $25 discount for each additional sibling or week of camp! Enter Promo Code “FAMILY” during registration to redeem your sibling and additional week discounts! Bring your little one to Fairview Farm for a morning full of fun nature games, stories and crafts. We buzz all over Fairview Farm, exploring nature and making new discoveries each day! Each week has a different focus, so campers can come for both. Week 1: July 29-August 2 focuses on the senses, as campers learn to explore using their eyes, ears, noses and sense of touch. The week ends with a fun scavenger hunt using all of our senses! Special guest Lolly Hopwood performs songs for kids about nature! Week 2: August 5-9 focuses on Fairview Farm’s beautiful plants and interesting creatures, from flowers to birds, bugs and butterflies! Discover the exciting mysteries of nature:  Who lives where? Who eats what? What’s hidden high and low? 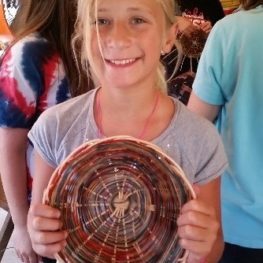 Campers learn the secrets of the woods, fields and streams through adventures, stories and games. Wild-crafts, storytelling, games and scavenger hunts open up even more explorations! Special guest Lolly Hopwood performs songs for kids about nature. Each week has a different focus, so campers can come for both. Week 1: July 15-19 focuses on gardening, bugs, survival techniques, fort building, birding and fishing in the pond. Week 2: July 22-26 we explore different habitats all over Fairview Farm, learn about reptiles, mammals and tracking techniques, and kayak in the pond! Adventure is waiting! Learn about the birds and animals living in the woods and fields of Fairview Farm, and investigate the creatures living in the pond. Explore nature with hikes, games, wild-craft projects, storytelling and more. Special guest Lolly Hopwood performs fun songs for kids about nature! Each week has a different focus, so campers can come for both. Week 1: July 15-19 we explore different habitats all over Fairview Farm. Campers learn about reptiles, mammals and tracking techniques, and kayak in the pond. 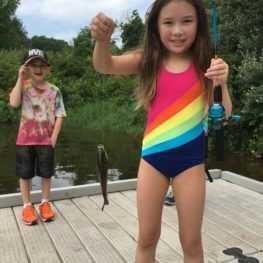 Week 2: July 22-26 focuses on gardening, bugs, survival techniques, fort building, birding and fishing in the pond. Experience the workings of a family farm! Roll up your sleeves and pitch in with the daily care of farm animals, work in the organic vegetable garden, learn about local wildlife, try your hand at traditional natural crafts, and more. Each day involves creative projects, outdoor experiences and exploration of habitats along the North Branch of the Raritan River. Each day focuses on a different farm creature, including sheep, pigs, chickens, honeybees and ponies. Held at Pleasant Valley Mills Farm in Mendham. Get your hands dirty learning about fun and healthy gardening techniques! 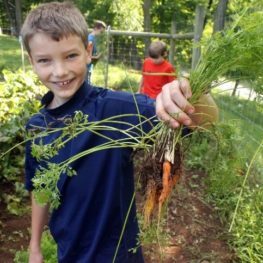 Campers learn about healthy plants and soils, water, garden ecosystems, and fun ways to enjoy your harvest. This camp is offered for a wide age range and will have separate and combined activities for different age groups. Grab your camera and explore Fairview Farm, learning to observe and record the amazing wildlife and wonders of the preserve! Campers learn techniques to capture moments of nature photos and short films. 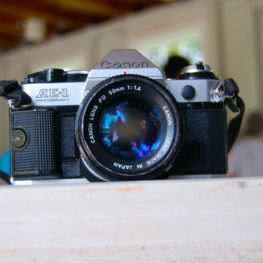 Beginning with the basics of cinematography and photography, the camp includes plenty of exploration time and culminates in a show of printed photos and a screening of camper video clips.